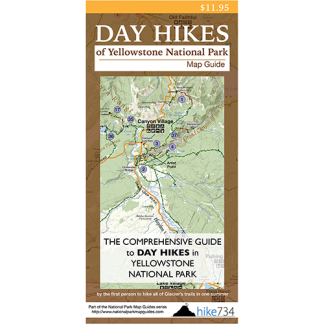 This one-way trip is a great tour of some of the vast meadows and drainages in the northern section of Yellowstone, and requires arranging a car shuttle. The trail starts near Blacktail Pond on the Blacktail Deer Creek Trail and works its way up through the vast sagebrush meadows. These meadows are great habitat for Yellowstone’s grazers such as bison and pronghorn. Once on the top of the plateau, take a left at the junction onto the Rescue Creek Trail, through a beautiful grassy meadow. At the top of a small ridge, the Rescue Creek drainage becomes visible. You drop into this valley, cross the creek, and work your way past the marshy edges. The trail then travels up the hillside. It veers away from the creek and up on another large grassy knoll with great views to the north. After a short traverse, the trail drops down into the cool shade from trees of an older, open forest. The trail alternates between pleasant meadows and forest as it goes past Turkey Pen Peak. 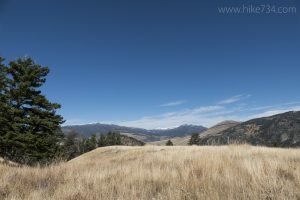 As the valley narrows, the trail begins to drop more quickly along the seasonal Turkey Pen Creek and out onto the flat grasslands along the Yellowstone River. The trail traverses the foothills with brief glimpses of the river as it approaches the town of Gardiner. It eventually takes you out onto a very flat grassland that heads towards the Gardner River, with a great view of Electric Peak. Cross the bridge over the river to the Rescue Creek trailhead. This trail can be paired with the Lava Creek Trail for a 14.5mi/23.4km loop that will require arranging a short car shuttle. To do this loop, start at the Rescue Creek trailhead and follow it up to a just before the Blacktail Pond. A faint trail, called the Blacktail Pond Spur Trail, takes off to the west and skirts the hillside on the north side of the pond for 2.3mi/3.7km to the Lava Creek Trail. Take the Lava Creek Trail all the way out to the Lava Creek trailhead. (See Lava Creek for description.) Then shuttle back to the Rescue Creek trailhead. Consult a ranger in the visitor center for details on finding the Blacktail Pond Spur Trail. Trailhead: The starting trailhead is located on the Grand Loop Road, halfway between Mammoth Hot Springs and Tower-Roosevelt. It is simply labeled “Blacktail”, on the north side of the road. The ending trailhead, signed “Rescue Cr.”, is located between the North Entrance and Mammoth Hot Springs on the North Entrance Road at the far north end of Gardner Canyon.